Our Advanced class were studying crime and law in their coursebook in October. To bring the topic to life, they met and interviewed a real magistrate, went to see real cases in court and became judges themselves in a virtual case online. First, the class learned vocabulary related to crime and law. Then they tried being a judge by following a ‘manslaughter’ case online using actors (this is different to ‘murder’ because there is no intention to kill). They experienced listening to evidence on both sides and debated how long the prison sentence should be. It is interactive and you can try it yourself on the government’s ‘You be the Judge’website: http://ybtj.justice.gov.uk/. To prepare for their court visit, the class interviewed a magistrate to learn about the criminal justice system which they said was “really interesting” and gave them “a lot of new information”. All criminal cases first appear before a panel of three magistrates who either hear the case there or refer it on to a higher court. Magistrates come from all walks of life so you don’t need to be a lawyer because you get special training. 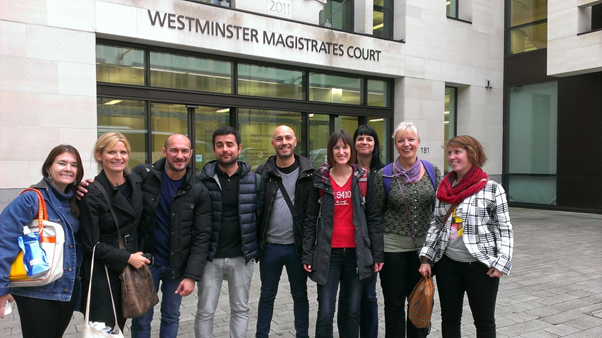 The class sat in the public gallery in Westminster Magistrates’ Court which is open to everyone. It is a court in central London and there have been big cases involving famous people that you can read about here: http://www.independent.co.uk/topic/CityOfWestminsterMagistrates’Court. If you’re thinking about learning English in Covent Garden or are looking for more information on the English courses on offer at EC Covent Garden 30+ please click on the link provided.